Classic Cuban mojito made skinny! 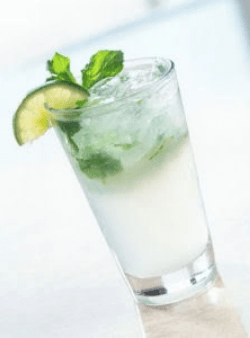 I have figured out an easy low point weight watcher mojito recipe that tastes great. This is a popular drink in all the trendy NYC spots. I’ve loved this cuban drink long before it became popular. Use this recipe and add a Caribbean flair to your next party! In a cool tall glass, muddle the mint, splenda and lime juice. Add rum, soda and stir well. Garnish with a lime wedge and a few sprigs of mint. How is this only 2 points when the booze is just 4? Hello, I was very curious about the calories so I did the math and I came up with 116 in one. So great job! I'm defiently going to have to try one! Hi… Love your recipes, we have tried quite a few this week! All very successful. One question, I realize this recipe hasn't been updated, but why did someone thing it was 7 points? If the rum is the only point ingredient… Wouldn't it be a 4 point cocktail? Please clarify because I really enjoy them and want to be sure I know how to calculate point correctly. Thanks! It is 4:30, Mother's Day. Just finished my one hour break sitting outside with this drink… fabulous! The mint that has invaded my flower bed now has a wonderful purpose, thank you! And happy Mother's Day! Gina, I would love to try this recipe but unfortunately I can't use splenda – I get sick from it. 🙁 Do you have any other sugar substitutes that you'd recommend? You could try Trivia or Stevia… just a thought. It's bikini time in Texas so I've been working out and eating right with my boyfriend so that we can look great for Lake Travis boat parties. I like to drink, so I've been trying my best to drink as low calorie as possible. I'm so happy to have found this recipe because I order these at the bar for $7 a piece! I made one tonight with your cilantro lime shrimp, roasted prosciutto wrapped asparagus, and some mashed sweet potatoes. I'M IN HEAVEN!! Thank you for making sure that I'm having fun and not deprived while trying to drop this last dress size. I honestly have not cooked any recipe not belonging to you in a month. This hasn't been updated to points plus yet. Sorry, this is still the old points, I still need to update points plus here. 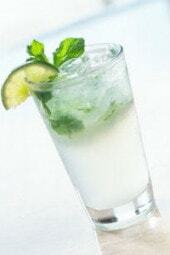 I love the mojito recipe, is the best! Just curious– for those of us not on WW.. would you happen to know how many calories and/or carbs are in one of your yummy cuban mojitos? Also- the strawberry mojito sounds delicious too! Gina–Please watch what people are posting on your blog. Neptunebaby posted the Weight Watcher quiz for determining points values. This is copywrited information and you could possibly be sued becaus it's on your blog. Just watching out for you. I would add Splenda to taste, try one first and see. Thank you!! 2 T. of splenda seems to be a lot – is that right? Love your recipes! 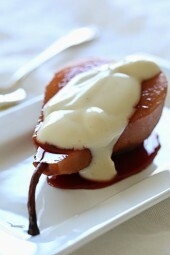 I love this receipe! I'm so thankful that I found your site! Yummy!! I think if you use Sprite zero which is sweetened, you could leave the sugar out, but it just won't be as sweet. Or add 1 tsp at a time until you like the taste. I've trained myself to use less sugar in my coffee and drinks so now I don't require as much. Agave might be nice in this too! I was wondering if there is anyway maybe to put real sugar but less and still get a decent taste? Splenda/fake sugar gives me a headache and tummy pangs. Any suggestions? And BTW… LOVE your blog. The recipes, points, pictures are lovely. Keep up the good work. @Joy- Strawberry Mojitos, sounds delicious!! My mint grows out of control!! But it's perfect for mojitos!! Aww, thank you! And you're welcome! thanks for all that you bring to those of us who are watching what we eat. you make it so easy and tasty. 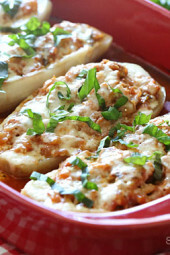 THIS IS ONE OF THE MOST AMAZING WEIGHT WATCHER RECIPE SITES THAT I HAVE EVER COME ACROSS. THANK YOU FOR ALL THESE TASTY RECIPES. I LOVE THE WAY YOU HAVE IT BROKEN DOWN. 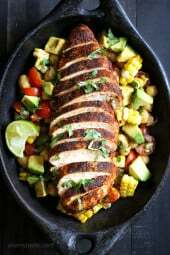 IT IS SO EASY TO FIND A RECIPE FOR THE FOOD THAT YOU WANT TO EAT. YOU ARE THE GREATEST. I make these mojitos all of the time! They are sooooo good and I dont have to feel all guilty! I only change one thing and that is that I use stevia instead of splenda!! You are ahhhhhhwesome! 🙂 Thanks Gina-bo-bina! I promise I will have more cocktails once I can drink!! P.S. Congrats on the bb. @Patty – Can't wait to have one! Five months pregnant right now, this is one thing I am surely missing this summer!! Absolutely Wonderful! Just the right combination for a hot summer night! How big is the bread? Light butter you can use the calculator to figure out the points, it depends on the brand and how much. with light butter be in points. I love mojitos! They are refreshing and I’m always worried about those empty points! Way to go. Thanks!